Armed with google maps, iPad and car, I ventured out of the hotel at 12:30 PM with a somewhat vague itinerary. Visit to KSIC factory and outlet shop was definitely on the cards, but beyond that my day was open. I’d take it as it comes. 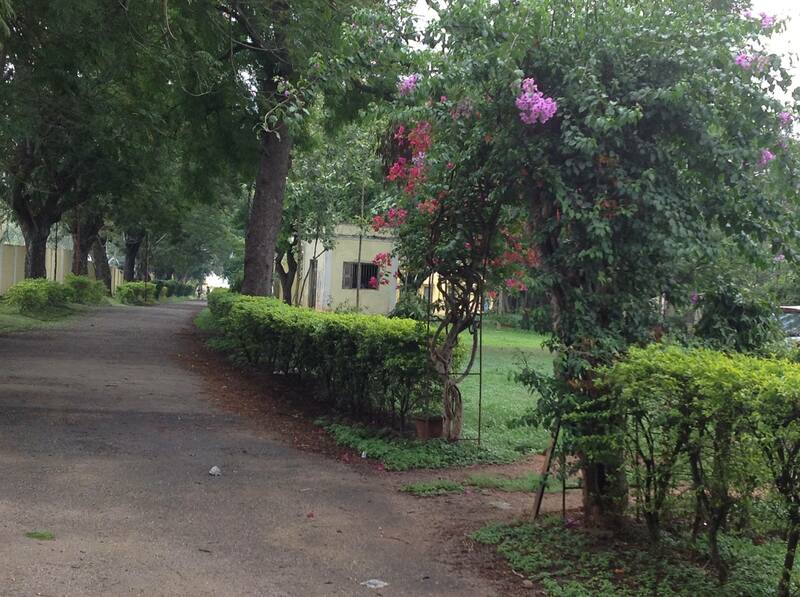 Reaching KSIC was easy enough and I pulled into their tree lined green campus by around 12:45 PM. 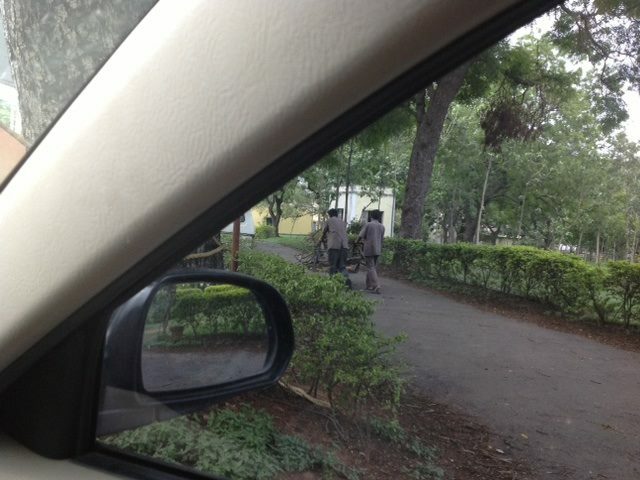 The friendly gate keeper sent me off to their factory entrance. I signed in and after the customary questions – where am I from, do I have a camera etc, I was inside the gates and walking up the path to start my factory tour. I discover that I am pretty much left on my own to explore. This is a positive thing, I say to myself while I walk into the first room where they are soaking silk yarn by the hanks and hanging them up to dry. There’s no bright lights and a sole worker goes about hanging newly soaked silk yarn hanks. I believe this is some sort of softening process that is happening here. 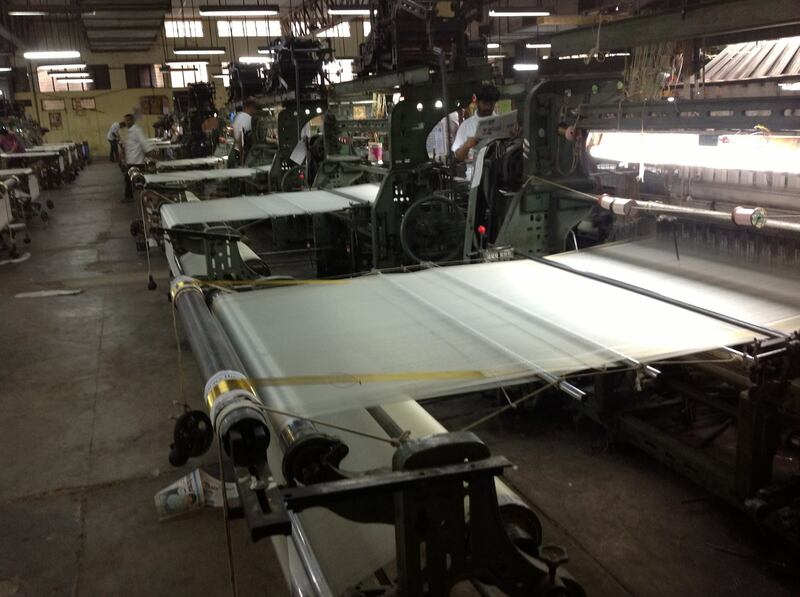 And it is about now I understand that the process at this place starts with silk yarn. 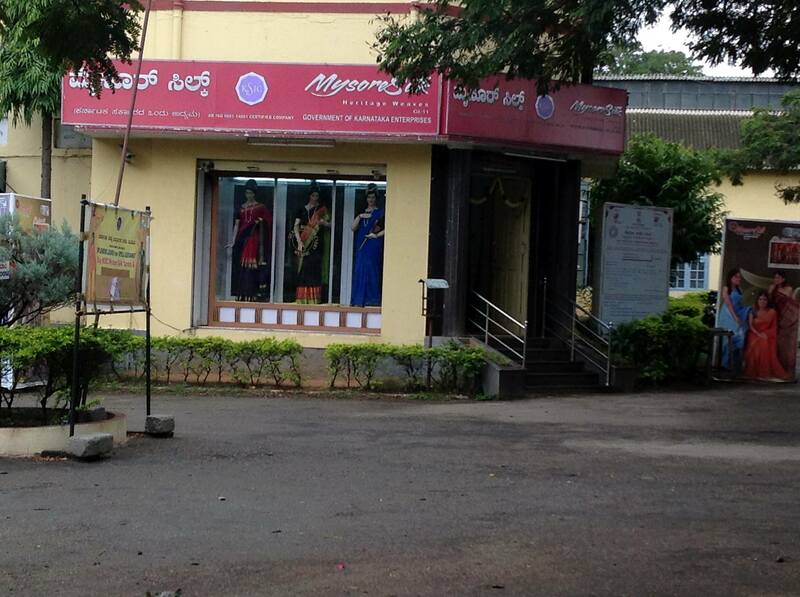 Spinning happens elsewhere and I intent to go there on my next visit to Mysore. But for now, let’s get back to our story. I managed to find a kind soul who walked me around and explained what the busy machines were doing. Step 1 – wind yarn into bobbins. Step 2 – Twist yarns from 2 bobbins together at 1400rpm to make a 2-ply thread. Step 3 – Twist the yarn again at 2400rpm to make the 2-ply thread, well, more tightly 2-plied. 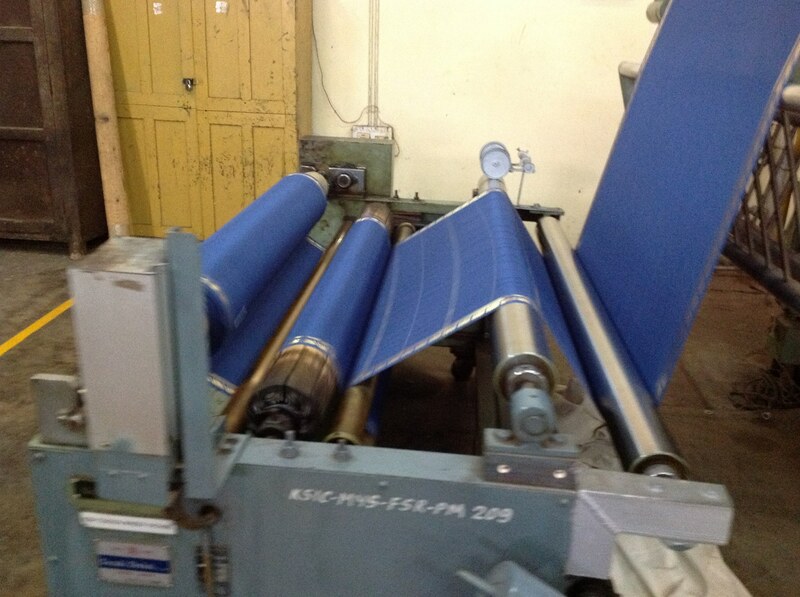 And this is happening over rows and rows of machines with their individual little bobbin twisters. Busy little bodies just whirring away! Next, I step into a corner where these bobbins are steamed to smoothen the 2-ply yarn. When they come out of the steamer, the yarn is visibly smoother and lies straight. Before steaming, they’d just curl up due to the tension created by twisting. 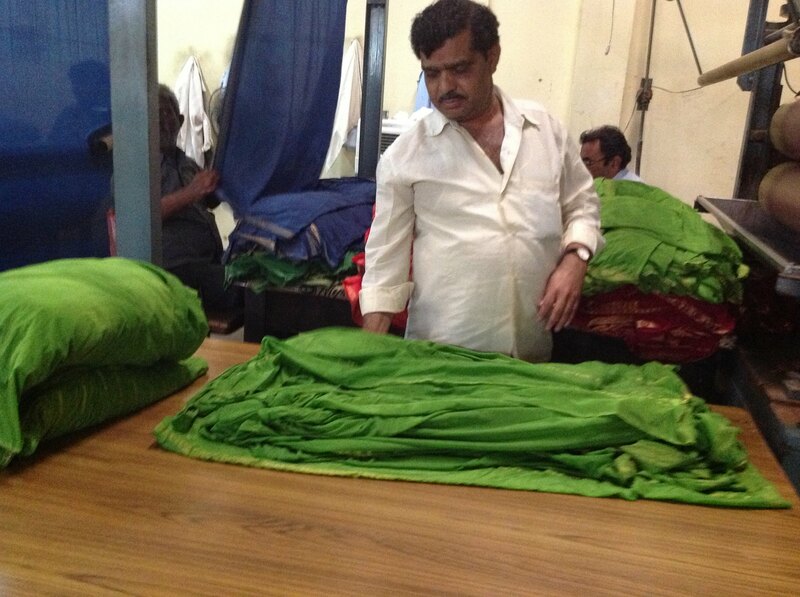 After their steam bath, the yarns looked quite happy and relaxed to move on into their glorious life as a GI marked Mysore Silk saree. 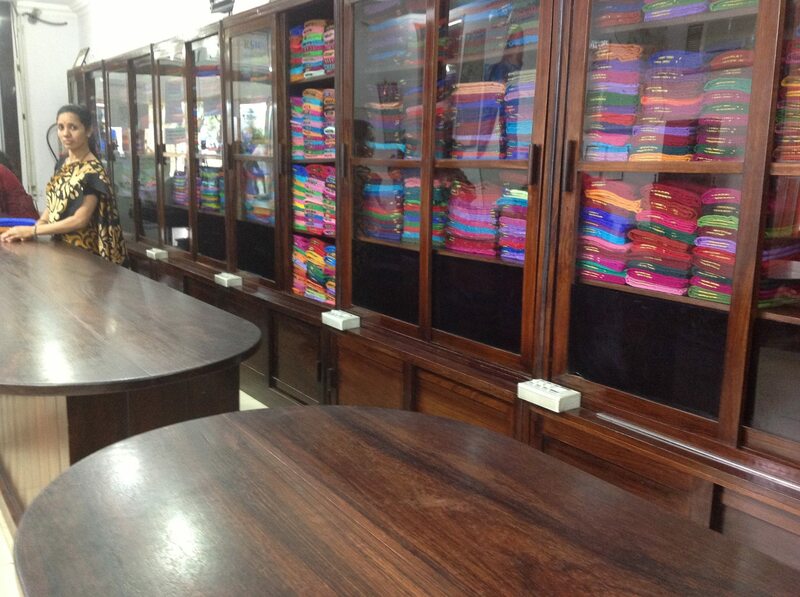 KSIC Mysore silk is not a yarn dyed fabric. Dyeing comes much later, after the weaving is complete. 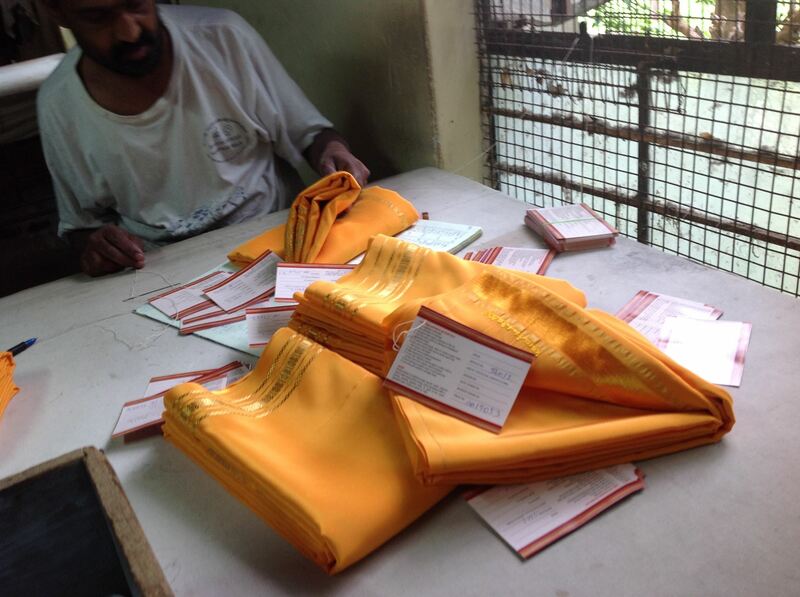 I saw a floor full of automated weaving machines busy making gold zari brocade edged saree lengths. Gold zari bobbins are fixed at either ends of the warp and each machine is set to weave in a different brocade design on the selvedges. 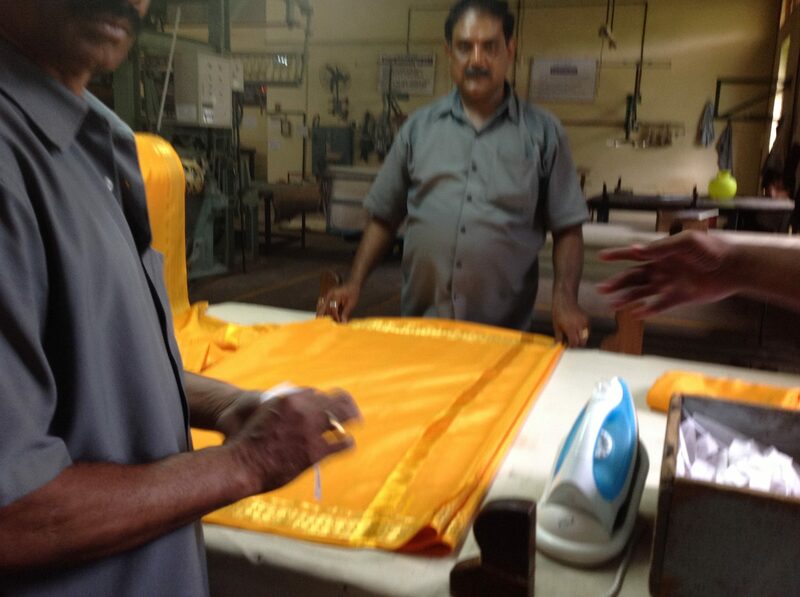 Gold zari brocade, the ancient weaving technique is the only decoration that a KSIC Mysore Silk saree gets. No embroidery, no crystals, no over the top nothing. 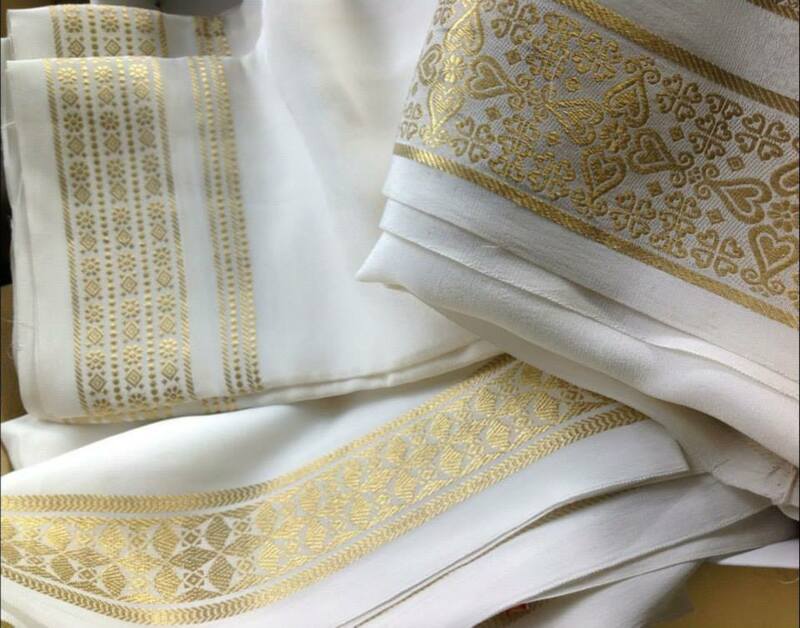 Just pure gold zari brocade, it is such a refined, regal garment. 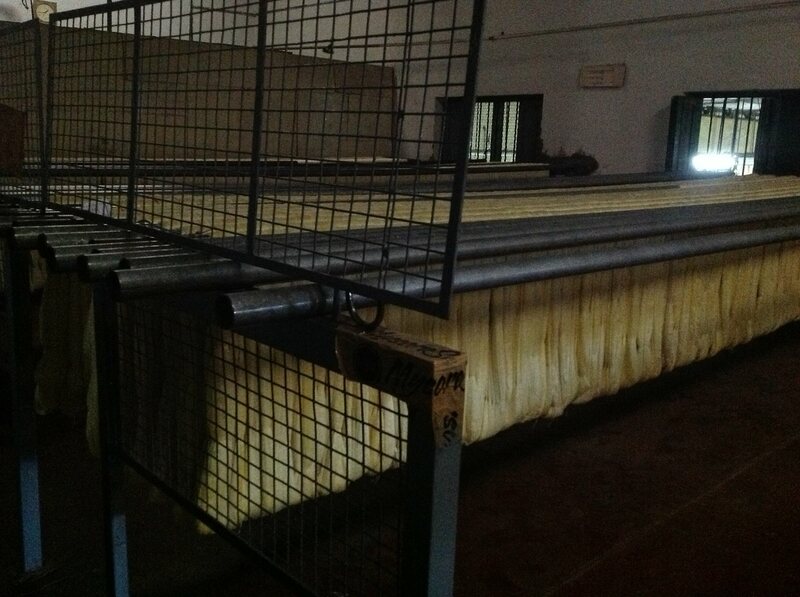 Woven saree lengths are sent to the dyeing room where a 4 hour automated dyeing process gets colors into the fabric. 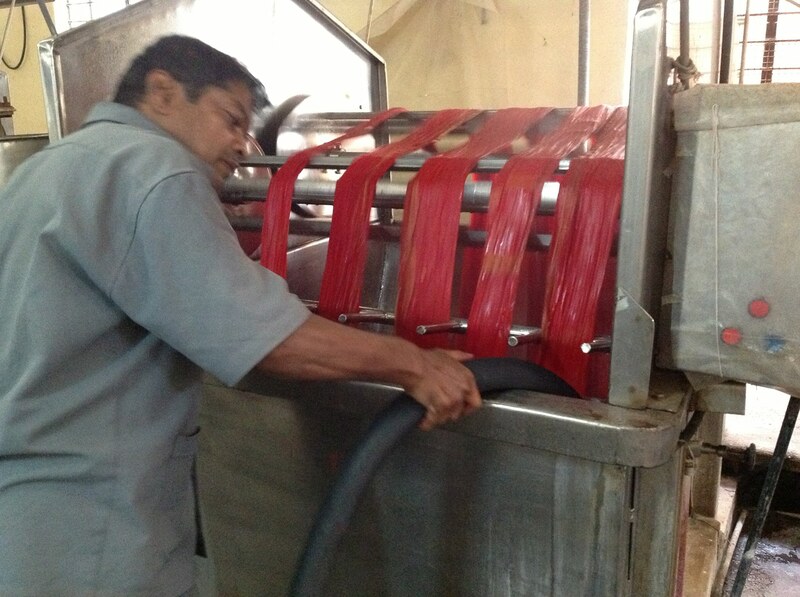 Dye vats have a roller mechanism which helps turn the fabric through the dye mix at an even pace. Temperature in the vat is electronically set to gradually increase from 0 to 95 degree centigrade during this 4 hour long activity. 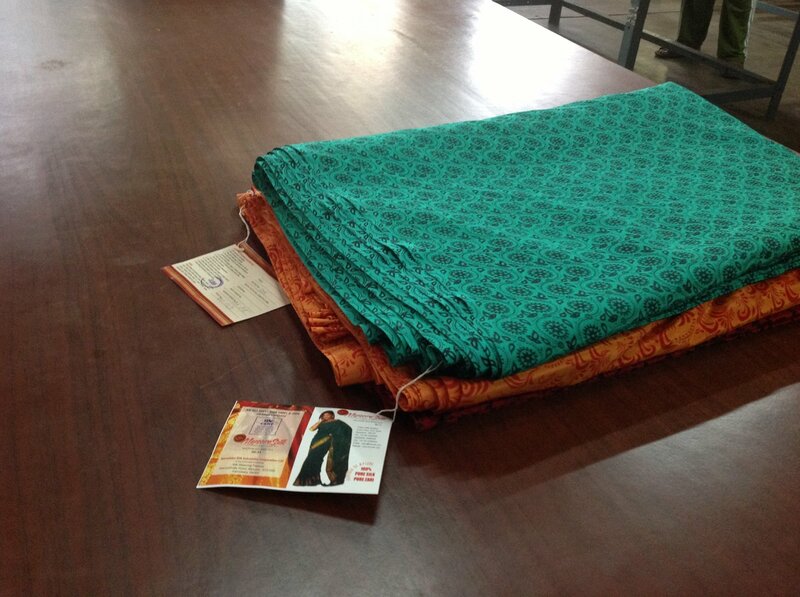 After a quick drying process and steam press, individual 6 yard sarees are cut from the rolls. 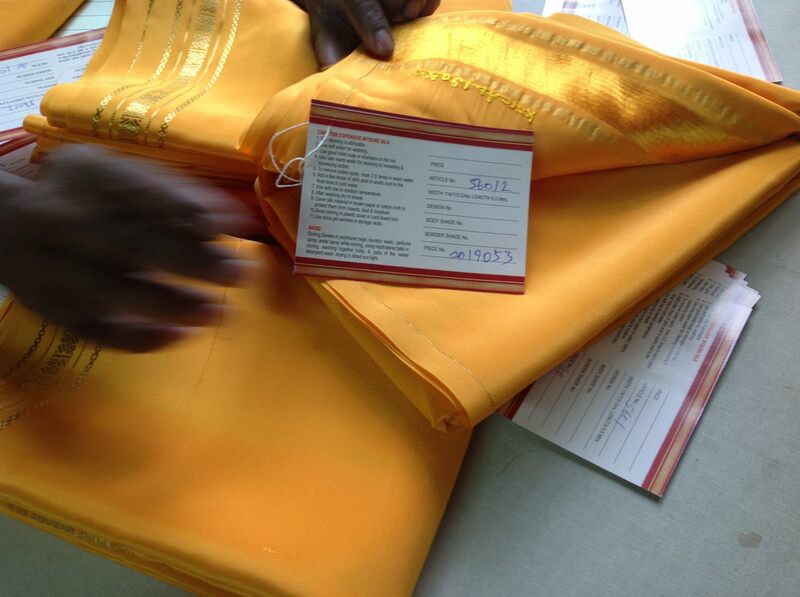 Each saree is uniquely numbered, stamped with the authenticity seal, hand tagged with a product details card and sent off to the inspection folks. 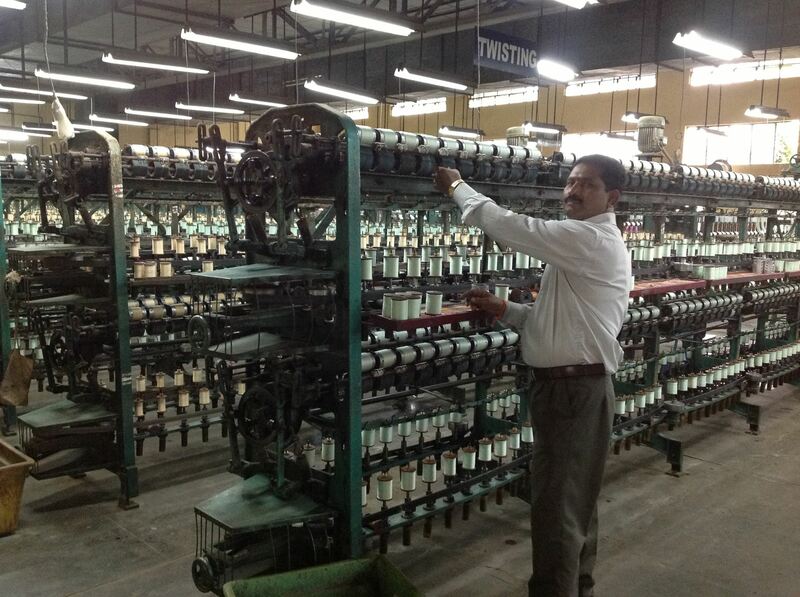 Here’s where they ensure that only the very perfect ones reach company owned showrooms all over India. Try as I may, my feet did prove it had a say when there’s possibilities for shopping. I pass on the blame to my feet for walking me into the factory shop and for the damages I incurred on my wallet. 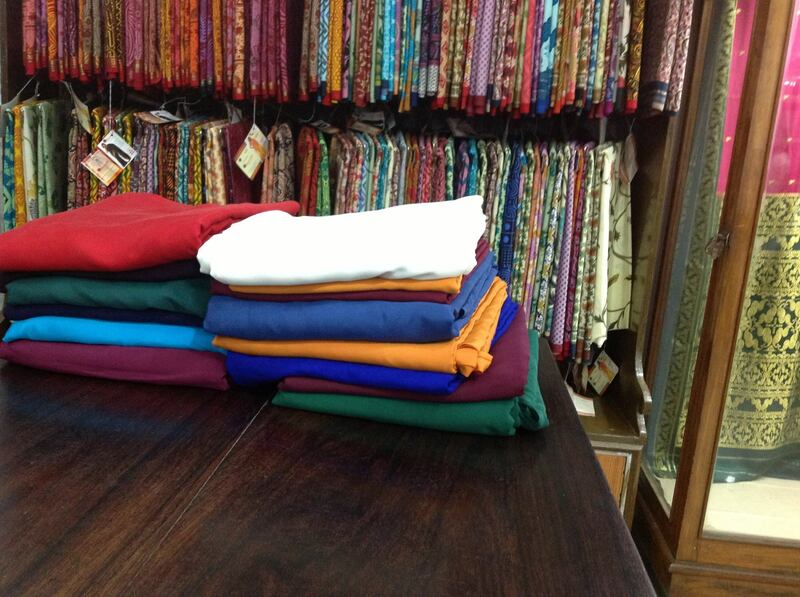 Here’s the shop, it is sheer eye candy! 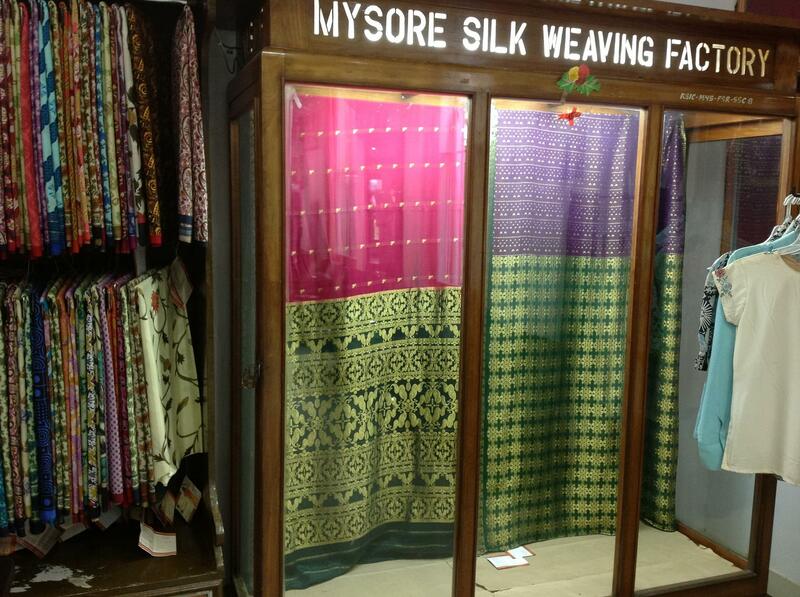 GI 11 – KSIC Silks has been awarded Geographical Indication (GI) Registration for Mysore silk and is considered the best crepe silk in India. It uses pure zari that has 0.65 percent of gold content and about 65 percent of silver content. 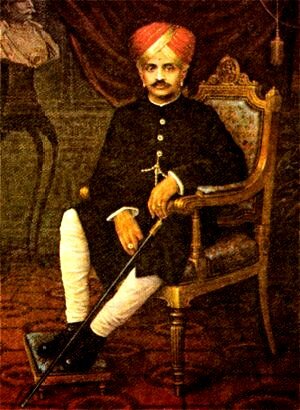 This establishment was founded in 1912 by His Highness Krishnaraja Wadiyar Bahadur, Maharaja of Mysore. 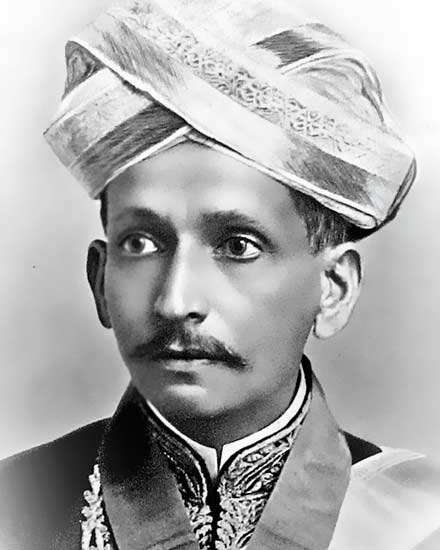 Factory was designed and built by Sir Mokshagundam Visvesvaraya. 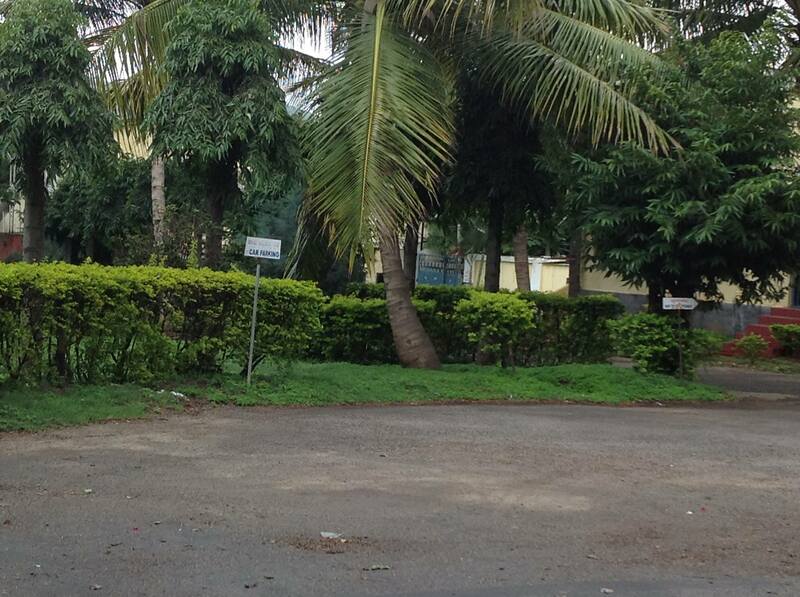 This factory is currently run by Karnataka State Industries Corporation, owned by Government of Karnataka. Happy employees, well looked after by the management helps run this heritage establishment at a profit year on year. 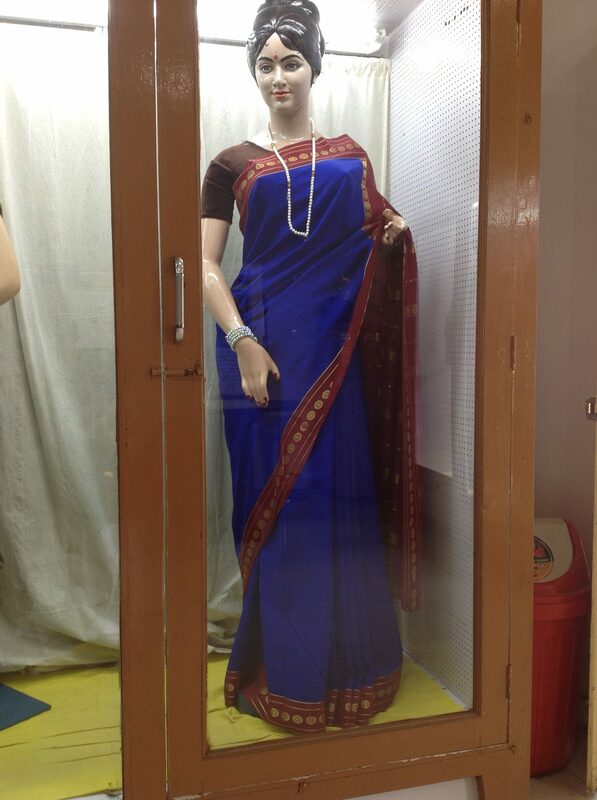 This entry was posted in The Roving Eye and tagged bridal silk, crepe silk, indian wedding, karnataka silks, KSIC Mysore Silk, KSIC Silk. Bookmark the permalink.